Limerick Council announced recently that it had promoted its Communications Officer to be Head of Marketing, a pretty un-noteworthy story even by the sleepy standards of local news in a small city. Yet the appointment marks the end of a sorry tale of money wasted, opportunities missed and the continuing damaging culture of secrecy that pervades Limerick Council. One of the unintended consequences of Fine Gael’s commitment in 2011 to consolidate some state bodies was that it left a number of people with lucrative permanent public sector jobs needing to be redeployed. Part of Limerick Council’s response was to set up a number of companies (why the separate companies were needed was never explained: was it to support salary increases outside of the public sector pay freeze? I suspect we will never know), including the Limerick Marketing Company, which was launched with great fanfare and an announcement that the company would double visitor numbers in five years. The company’s two employees came from state agencies that were affected by Enda Kenny’s putsch on quangos. This ‘company’ never published any details about its staff or its activities beyond a pretty bland statement of objectives on the Council’s website. Two and a half years later, due to restructuring in staff in the council, the need for the company has gone and the idea has been quietly forgotten (and presumably, the objective to double visitor numbers has died with it). It’s difficult to criticise the marketing of Limerick that has taken place over the last three years because frankly there wasn’t that much of it. Sure there were a few articles in the local papers, which I’m sure provided gratification for the individuals involved, but there was very little national or international coverage, and so in the absence of any other evidence it seems like the objective of Limerick Marketing Company was “Let’s tell ourselves how great Limerick is, and we’ll hope someone outside the city notices”. One of two flagship events of the Limerick Marketing Company was Riverfest, an event rightly criticised by Brian Leddin last year as an event that “reflects a city as sophisticated as a Supermacs outlet on a Saturday night”, and that was “lame and mediocre”. Brian’s full article is worth a read as he also highlights the inward looking approach to marketing our city. The second event was acknowledged locally to be a complete disaster. The marketing company spent half of its annual budget underwriting a “rugby world club sevens” event, and a five-year contract was signed with a private company to underwrite this event. The Limerick Leader reported that the turnout was “paltry”, with only 300 people attending one of the events in Thomond Park, and a total subsidy of €200 for every ticket sold from the public purse. The Leader termed Limerick Marketing Company’s justification for the event to be “self-serving drivel” – strong words for a local newspaper that is normally very supportive of local events. 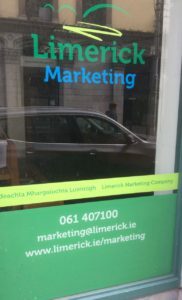 The new marketing company was stitched in to the fifteen year socio-economic plan for Limerick (the “Limerick 2030 Plan”) – with nineteen specific actions assigned to it. Even though the marketing section of the 2030 plan was perhaps one of the weakest sections of the document (I described it as being “pretty terrible” in my submission to the plan), at least it published some initial steps that the Limerick Marketing Company could take. Out of nineteen actions I cannot find any evidence that any of them were completed, even though all actions were due to have been completed by the time the company ceased operations. The one positive initiative that the Limerick Marketing Company was involved in was the ‘street ambassador programme’ that ran over the summer months. This wasn’t an initiative of the Company – it merely inherited responsibility for it. Once the company inherited the responsibility, it promptly scrapped the programme. In fact there is no evidence that the company ever traded at all. The most recent returns of Limerick City & County Marketing Limited were made in April 2016, where the accounts showed no activity beyond the issuing of a share capital of €2. It was reported recently that the board of the company hasn’t met in the last two years. It didn’t need to be like this. Between promoting a culture of openness, creativity, debate and vibrance; and targeting specific visitor niches where we can compete effectively; we really could have doubled visitor numbers in five years. Instead it feels like we will continue talking to ourselves, and the promises will continue to be forgotten.